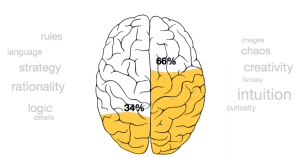 According to some random internet quiz, I am 34% left brain and 66% right brain. I have taken these types of things before, and the answers are usually similar, that I am pretty much right-brain dominant. If you care about Meyers Brigg personality typing, I am ENFP. (Extrovert, Intuition, Feeling and Perceiving) … or something like that. If you like Astrology, I am a Leo. More importantly, I am human and I am female. These two facts will never change and cannot be disputed, at least I hope not. Now because I am a female human, I can attach emotions to scientific data, when really – there is no need to do such.